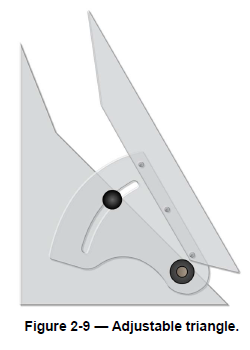 The adjustable triangle, shown in Figure 2-9, combines the functions of the triangle and the protractor. When it is used as a right triangle, you can set and lock the hypotenuse at any desired angle to one of the bases. The transparent protractor portion is equivalent to a protractor graduated in 1/2-degree increments. The upper row of numbers indicates angles from 0 to 45 degrees to the longer base; the lower row indicates angles from 45 to 90 degrees to the shorter base. By holding either base against a T-square or straightedge, you can measure or draw any angle between 0 and 90 degrees. The adjustable triangle is especially helpful in drawing building roof pitches. It also allows you to transfer parallel inclined lines by sliding the base along the T-square or straightedge.